The venous return in the brain doesn’t follow the arterial pattern. The veins of the brain are incredibly thin walled as a result of absence of muscular tissue in their own walls. The veins of the brain possess no valves. The veins of the brain run primarily in the subarachnoid space. The veins of the brain constitute cerebral veins, cerebellar veins and veins of the brainstem. The cerebral veins drain the external surfaces and the internal regions of the cerebral hemisphere, respectively and are split into external (superficial) and internal cerebral veins. The external cerebral veins drain the surface (cortex) of the hemisphere and are split into 3 groups, viz. The superior cerebral veins are about 8-12 and drain the upper parts of the superolateral and medial surfaces of the cerebral hemisphere. They ascend upwards, pierce the arachnoid mater and traverse the subdural space to go into the superior sagittal sinus. 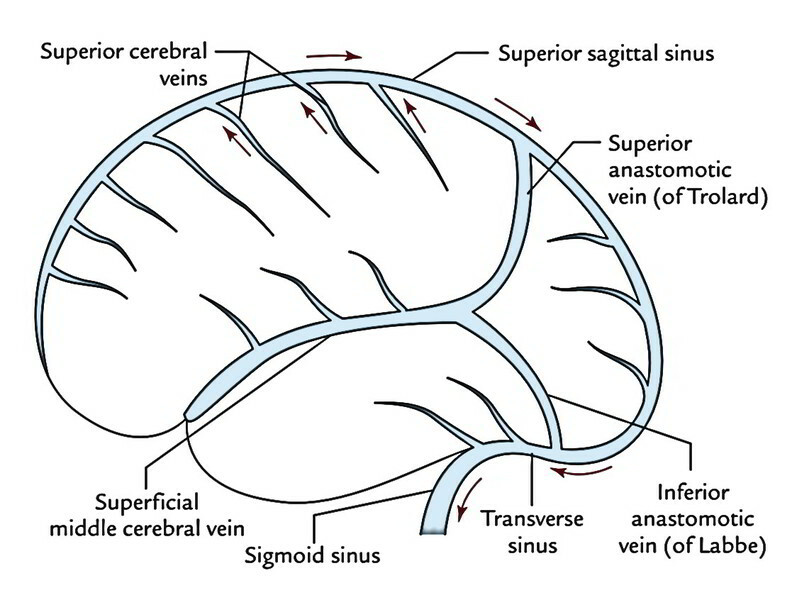 The anterior veins open at right angle, while the posterior open obliquely against the flow of bloodstream in the superior sagittal sinus, thus preventing their failure by increased CSF pressure. The middle cerebral veins are 4, 2 on every side: superficial middle cerebral vein and deep middle cerebral vein. The superficial middle cerebral vein is located superficially in the lateral sulcus. Anteriorly, it runs forwards to drain into the cavernous sinus while posteriorly, it interacts together with the superior sagittal sinus via superior anastomotic vein (of Trolard) and with the transverse sinus via inferior anastomotic vein (of Labbe). The deep middle cerebral vein is located deep in the lateral sulcus on the insula alongside middle cerebral artery. It runs downwards and forwards and joins the anterior cerebral vein to create the basal vein. The inferior cerebral veins are many in number but smaller in size. They drain the inferior surface and lower parts of medial and superolateral surfaces of the cerebral hemisphere into nearby intracranial dural venous sinuses, e.g transverse sinus. It accompanies the anterior cerebral artery around the corpus callosum and empties the parts of medial surface, which can’t be emptied into the superior and inferior sagittal sinuses. Optic tract and olfactory trigone. Inferior horn of the lateral ventricle. There are just two internal cerebral veins found 1 on either side of midline in the tela choroidea of the 3rd ventricle. The 2 internal cerebral veins run posteriorly, 1 on either side of midline, between the 2 layers of tela choroidea of 3rd ventricle and connect together below the splenium of corpus callosum to create the great cerebral vein (of Galen), which empties into the straight sinus. The thalamostriate, septal and choroidal veins are the most essential deep veins of the cerebrum. 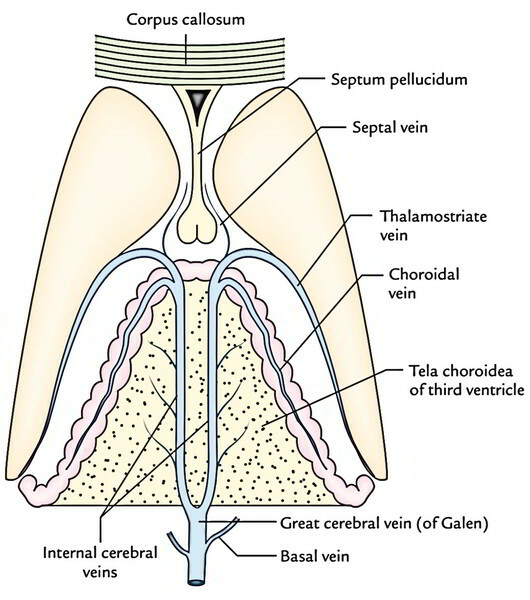 As their names indicate, the thalamostriate (striothalamic) vein empties the thalamus and basal ganglia; the septal vein empties the septum pellucidum and the choroidal vein empties the choroids plexus. Veins from colliculi (tectum of midbrain). Veins from cerebellum and adjoining parts of the occipital lobes of the cerebrum. Superior cerebral veins: They drain the upper part into the superior sagittal sinus. Inferior cerebral veins: They drain the lower part into the superficial middle cerebral vein, yet some from the posteroinferior part drain into the transverse sinus. Inferior cerebral veins from the orbital part: They drain into the superficial, middle cerebral and anterior cerebral veins. Inferior cerebral veins from the tentorial part: They drain into: Venous sinuses at the base of skull, viz. cavernous, superior petrosal, straight and transverse sinuses. Superficial middle cerebral vein, which empties into cavernous sinus and basal vein, which empties into the straight sinus. Superior cerebral veins: They drain the upper part into superior sagittal sinus. 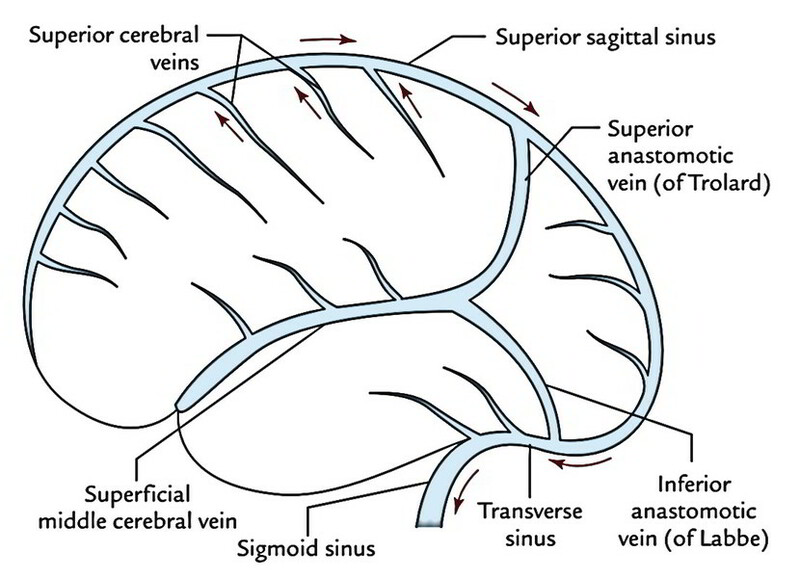 Inferior cerebral veins: They drain the lower part into the inferior sagittal sinus. Some of the veins from the posterior part: These veins drain into the great cerebral vein. Anterior cerebral vein: It empties the anterior part. In conclusion, the superficial veins drain primarily into the superior sagittal sinus, which ultimately empties into the right internal jugular vein. On the other hand, the deep veins drain primarily into the great cerebral vein, which ultimately empties into the left internal jugular vein. It occurs due to rupture of cerebral veins in the subdural space. The cerebral veins are torn following average trauma on head because while traversing the subdural space en-route to drain into the dural venous sinuses have little support. The superior cerebral veins are most generally tornat the point where they go into the superior sagittal sinus. The reason is generally a strike on the front or rear of the head, leading to excessive anteroposterior displacement of the brain inside the skull. Therefore the cerebral veins in the subdural space (termed bridging veins) are unduly stretched and torn. The subdural hemorrhage is usually extensive due to the free connection between the dura and arachnoid.